Publisher: Caption title: Banking and currency.Filmed from a copy of the original publication held by the Library of the Public Archives of Canada. Ottawa : Canadian Institute for Historical Microreproductions, 1981..
Caption title: Banking and currency.Filmed from a copy of the original publication held by the Library of the Public Archives of Canada. Ottawa : Canadian Institute for Historical Microreproductions, 1981. "CIHM/ICMH Microfiche series -- no. 23568" serie. 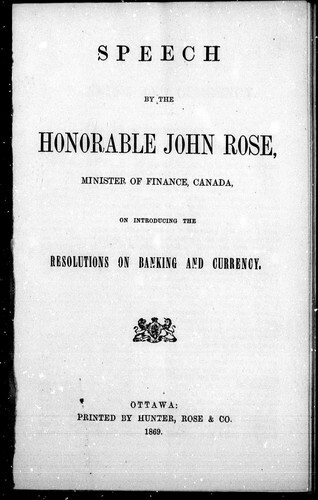 The More e-Books service executes searching for the e-book "Speech by the Honorable John Rose, minister of finance, Canada, on introducing the resolutions on banking and currency" to provide you with the opportunity to download it for free. Click the appropriate button to start searching the book to get it in the format you are interested in.